Plaid Hat Games (Dead of Winter, Summoner Wars) is known for making very thematic games, so me and my group were excited to do this Mice and Mystics review. There won’t be any spoilers here, but you should still get a good feel for how the game works. What is Mice and Mystics? 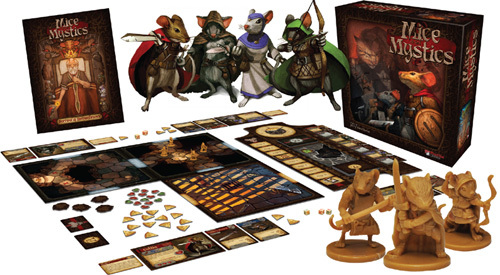 Mice and Mystics is a story-driven cooperative game designed by Jerry Hawthorne and published by Plaid Hat Games. Players take on roles of characters that are loyal to their king but have been turned into small mice. Players must work together in order to save the kingdom while dealing with unusual enemies. The game starts with the choosing of a story chapter, and then players choose the mouse they want to play. Each mouse has its own unique stats and a power, and players will also start out with their own ability cards. When you choose a mission/chapter, you will need to set up the appropriate tiles and place both the heroes and the enemies in the appropriate places. The main thing that you are trying to do in each chapter is clear off all of the minions so you can move through the rooms quicker. The storybook will tell you exactly how many rooms you need to get through and the amount of time you have to complete the objectives. The movement and fighting systems are quite simple. To move, you will combine the numbers on the dice you roll with your movement rating and move up to that many spots. When fighting, you will roll the amount of dice that are written on your card. The cheese tokens are a vital part of this game. Cheese allows you to level up your character, share with your teammates, and use your special abilities. The opponents also use the cheese by adding it to the cheese wheel, which both speeds up the game and brings out more enemies. The players win when they complete the objectives listed in the storybook. They lose if they run out of time before completing those objectives. If you’d like to see a more detailed explanation of how to play Mice and Mystics, check out the official Mice and Mystics rule book (PDF). The greatest strength of Mice and Mystics is its theme. The stories that you’ll find in the storybook are very well written and help the game come alive. Without the strong storytelling, this game would probably be average at best. As it is, it’s a very good game for anyone who likes to use their imaginations while playing a board game. Obviously, it is great choice for older kids. This isn’t a “miniatures game,” but the Mice and Mystics miniatures are top quality and rival those found in miniatures games. Since Mice and Mystics is a story-driven game, it’s nice that they made these minis so detailed because it helps you to get immersed in the world. These map tiles are beautiful. One problem I often have with dungeon crawls is that they have tiles that are bland or the same art is used on all of them. Well, that’s definitely not a problem here. These are beautiful and bright tiles that look fantastic on the table. It’s always great when family games are easy to learn and teach, and that is definitely the case with Mice and Mystics. For some, the fact the game takes about two hours is a plus, but for many that may actually be a drawback. The gameplay is a bit repetitious, so players who aren’t very into the theme may get a bit bored. This is a family game through and through. That’s not a bad thing, of course, but it also means that a group of adults might not enjoy it after a couple of plays. This Mice and Mystics board game is a solid cooperative game for the family. The gameplay is simple and a bit repetitive, but its stories are so good and the theme is so unique (and well implemented) that most people will have a fun time playing it. A few people in our group think that it should be in our top 5 cooperative games for families, but it just missed the cut. (Update: We like Stuffed Fables (same designer and style) a bit more than this one. 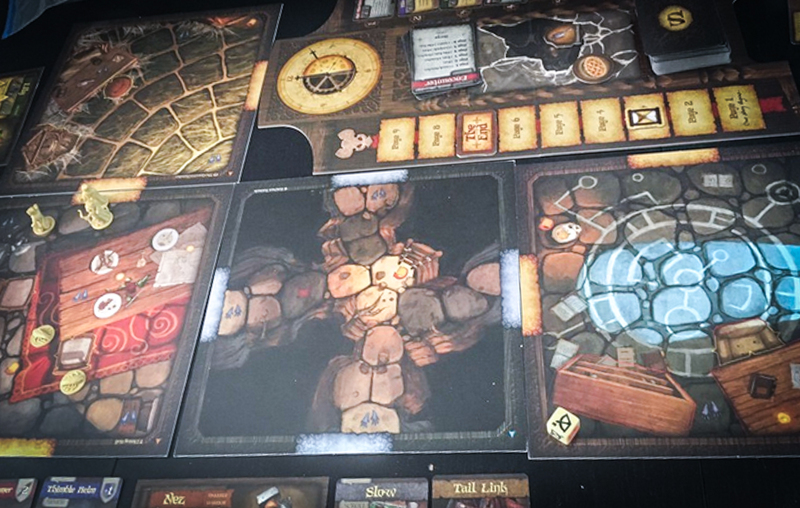 Thanks for taking the time to read our Mice and Mystics board game review!